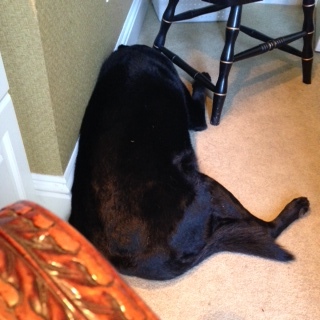 Sitting in my office, I have a black Labrador Retriever on one side and a yellow Lab on the other. I’m typing fervently trying to finish a writing project when the phone rings. Using might, I push my office chair over the thickly padded carpet to stretch for the smart phone laying on the desk behind me. My office has two desks. The first is built-in to make this former model home “all that it could be.” It has electric plugs beautifully positioned in terribly inconvenient places so the cords spread out, creating a knotted matrix. The second desk sits in the middle of the room and acts as a giant in-box. The phone rings again. I can’t reach; I rotate the chair, step over a dog, and grab the phone. While I lean, Maggie anticipates my move and stands up between my legs. I stumble forward; she stumbles backwards. Maggie is old, has epilepsy, bladder control issues, and weak hips. When she falls back down, her legs splay out to either side. Meanwhile, Simon assumes we are playing and rushes around the desk to join the activities. Maggie tries to stand again but Simon knocks her back down. “No, I don’t like saving money.” The telemarketer didn’t like my reply and hangs up. 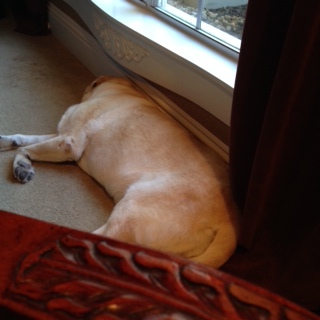 The dogs settle down and I scoot my chair back into its former position. I’m wedged in, zealously banging on the keys of my laptop. My phone rings again. This time it’s sitting next to me. I didn’t like his answer. I hang up. I’m typing. The doorbell rings. This time I have to move, the dogs move too, trying to guess where I will go. Simon stops in front of me. I trip. Maggie falls. I watch the UPS man leave a package of shoes by the door and walk away. I sit. I type. The phone rings. It’s another child in another room. It’s a conspiracy. I hang up the phone. The dogs circle. Once, twice, three times, four, Simon lies down, five, six, Maggie plops down when Roomba enters the room. Roomba. God Bless Roomba. She’s a modern marvel and I’m lucky to have her. Roomba roams the house every day at 5 pm. In theory, she vacuums up dog hair and crumbs then finds her way back home. In theory. But like all the other living things in the house, she usually ends up wherever I am, demanding attention. Today is no exception. She hums into the room attempting to sneak past Simon looking for me. Simon bounds up and tries to slide under my feet pulling the plugs from the wall. Roomba bounces off Maggie who turns and growls before snapping at the threatening disc-shaped robot. 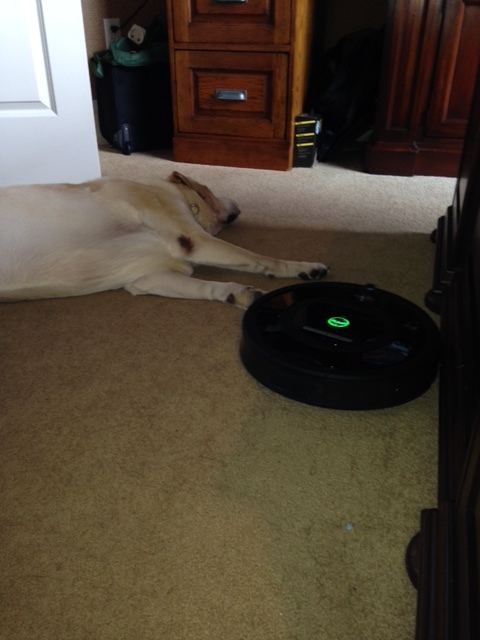 Roomba doesn’t back down, Maggie won’t move. A standoff ensues which involves loud barking and buzzing. I turn and yell at Roomba. “Get out!” I irrationally wag my finger and point to the living room. “Mom?” A voice resounds from the hallway. He stops, I assume, to decide if it’s safe to enter the office. “No, not you, never mind.” I push my chair back, Simon’s up. Maggie’s up. I pick up Roomba. “Move Roomba to another room,” Roomba scolds, obviously mad at the unfounded attack against her. I look at my child who’s flopped onto the floor to allow the dogs to climb on top of him. 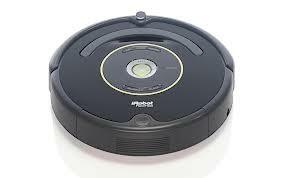 I pause, holding Roomba between my hands and thank my lucky stars I didn’t have to vacuum.